Today is a just a so so day for me...nothing special, some more ... I'm feeling the blues, maybe because of the thoughts of the Christmas season fast approaching and yet I cannot see any signs of Christmas spirit floating in the air. Too bad, my work place does not pay particular attention into celebrating Christmas. Luckily, I managed to see one reminder that it's going to be Christmas soon.. that's a 14 footer Christmas Tree put up on the hotel lobby. Aside from this, nothing else. Hmm..too bad. But I already get used to it. Normally, I would just content myself doing a cyber walk trying to scout for some Christmas goodies on the net. My laptop has been my best friend lately. 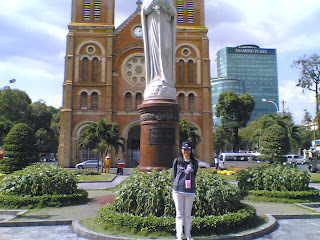 Browsing through my folder, I've seen these pics of my first visit to Notre Dame Cathedral in Saigon. I've been there a couple of times but I wasn't able to attend a mass. The schedule of the mass there is not really known to me. Most of the times, the church is closed. So on my first visit there, I just content myself admiring the French inspired architectural structure of the church building from the outside. I saw a lot of tourists taking photos just in front of the church building, as well. I wish I could drop by there this Christmas to attend a mass. 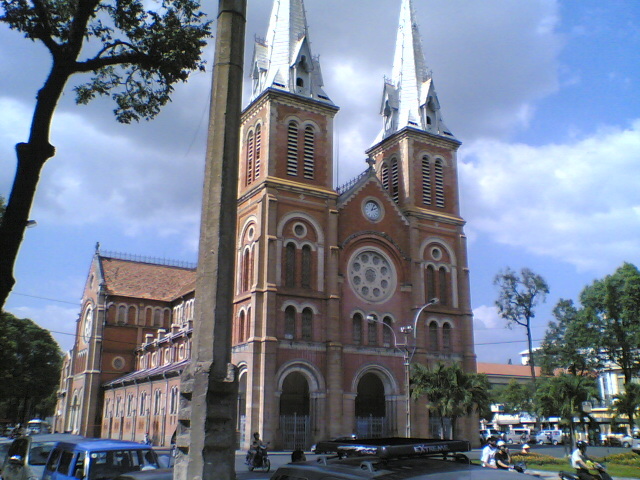 Notre- Dam Cathedral Basilica is situated at the heart of Hoh Chih Minh City and one of the city's famous land marks. This French inspired building of two towers was built in between 1863 and 1880 from which some of the materials used for construction were said to be imported from France.. I'm looking forward for my next visit there this month and I do hope I would be able to hear a mass this time. Hi Krizza, this is Bennett. You can find more info here : http://hcmc.pbworks.com. Did it for my friends and relatives who want to visit HCMC. And my friend (also Ben) has an even more impressive and professional website about Vietnam with beautiful panoramic photos : http://www.vietnam720.com/. Hope this helps. Cheers!